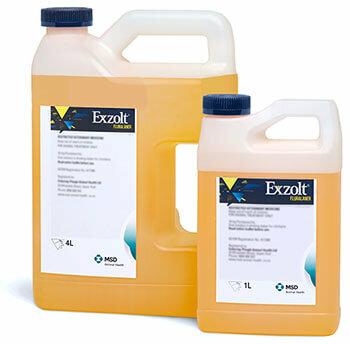 Exzolt contains 10 mg fluralaner per mL of solution for use in drinking water for chickens. 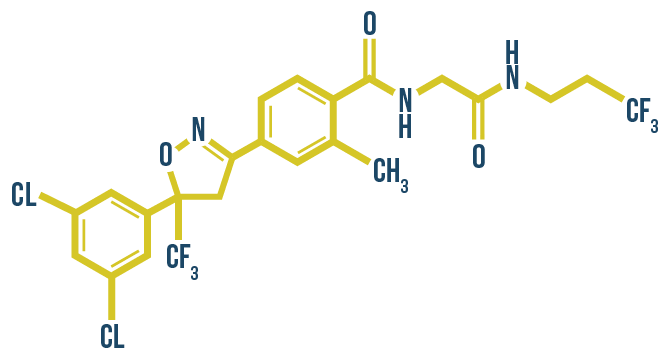 Excipients include α-tocopherol, diethylene glycol monoethyl ether, and polysorbate 80. It is a light yellow to dark yellow solution for use in drinking water. Treatment of poultry red mite (Dermanyssus gallinae) infestation in pullets, breeders and layer hens. Dose: 0.5 mg fluralaner per kg body weight (equivalent to 0.05 mL Exzolt) administered twice, 7 days apart. The complete course of treatment must be administered for a full therapeutic effect. If another course of treatment is indicated, the interval between two courses of treatment should be at least 3 months. Determine the duration of time (between 4 and 24 hours) over which to administer the medicated water on the treatment day. This period of time must be long enough to allow all the birds to receive the required dose. Estimate how much water birds will consume during treatment based on the previous day’s water consumption. The product should be added to a volume of water that the chickens will consume in one day. No other source of drinking water should be available during the medication period. Calculate the volume of product needed based on the total weight of all birds in the house to be treated. To ensure administration of the correct dose, the body weight should be determined as accurately as possible and an accurate measuring device should be used for measuring the calculated volume of the product to be administered. Therefore 500 ml of product treats 10,000 kg body weight (e.g., 5,000 chickens of 2 kg body weight each) per day of treatment administration. Follow instructions on the full package leaflet to prepare medicated water. None known. 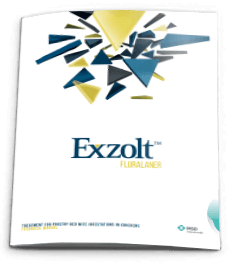 In the absence of compatibility studies, Exzolt must not be mixed with other veterinary medicinal products. Safety has been demonstrated in layers and breeders, and product can be used during lay. No adverse reactions observed following treatment of 3-week old chickens, adult chickens, or laying hens (egg production) dosed at up to 5-times the recommended dose for 3-times the recommended duration of treatment. No adverse effects on reproductive performance when breeding chickens were treated at 3-times the recommended dose for 2-times the recommended duration of treatment. Strict biosecurity measures at house and farm level should be implemented to prevent re-infestation of treated houses. To ensure long-term control of the mite populations in a treated house, it is essential to treat any other infested poultry in houses in proximity to the treated one. The veterinary medical product may be slightly irritating to skin and/or eyes. Avoid contact with skin, eyes and mucous membranes. Do not eat, drink or smoke while handling the product. Wash hands and contacted skin with soap and water after use of the product. In case of eye contact, immediately rinse thoroughly with water. If the product is spilled, remove any affected clothes. Packaged in 1-L and 4-L bottles (HDPE) closed with an aluminum/polyester foil seal and a child-resistant polypropylene screw cap. Shelf life as packaged: 3 years. Shelf life after opening the immediate packaging: 1 year. Shelf life of medicated drinking water: 24 hours.